It's been 40 hours since I have been outside. About 32 hours ago the temperature fell below 0 degrees. 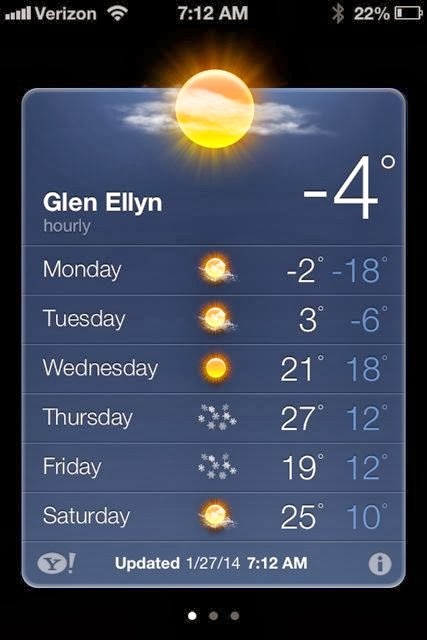 And I mean air temperature, not wind chill. This morning I woke up to this. . . It's mind blowing! Especially after yesterday. . . I am going to have to stand on my balcony today just to see what it feels like. I think I will finish my morning coffee, though (and build up my courage). 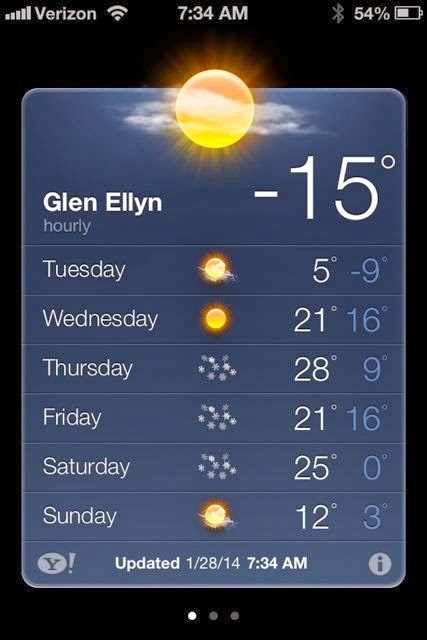 It's tough being a native Floridian living in the cold midwest. I hope you are staying warm wherever you are. One day I was walking through the lobby of my apt building and happened upon an abandoned painting. It was a print of giant poppies, the kind that can be bought at a bed and bath store. 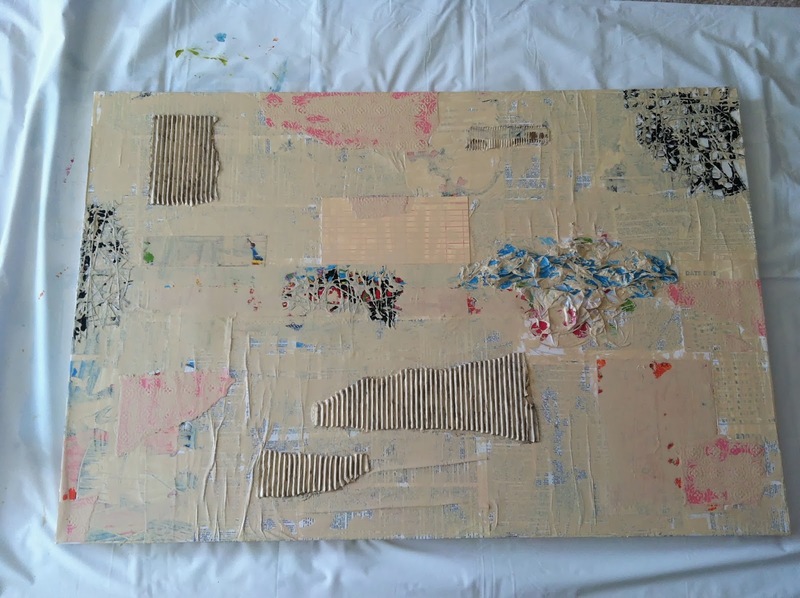 I decided that it would be the perfect canvas for an experiment in abstract art, so I took it home. 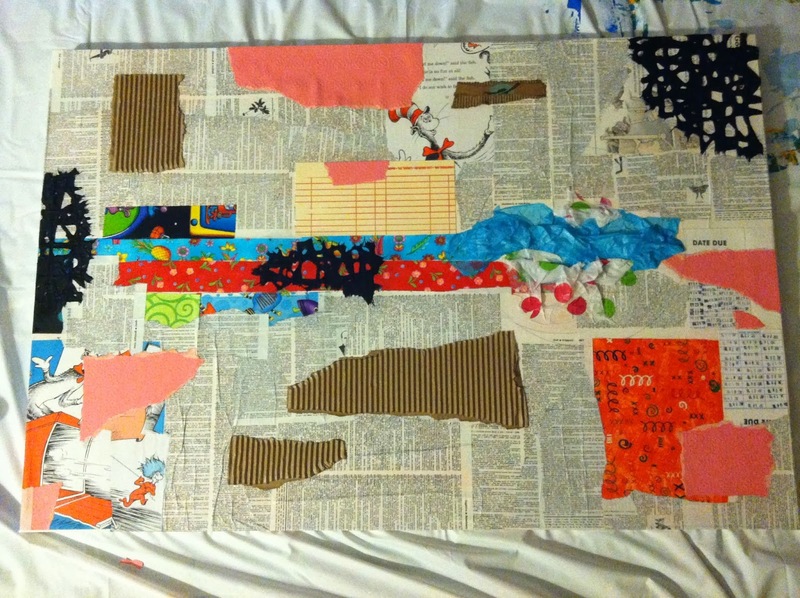 First I collaged the canvas with fabric, paper, and book pages. 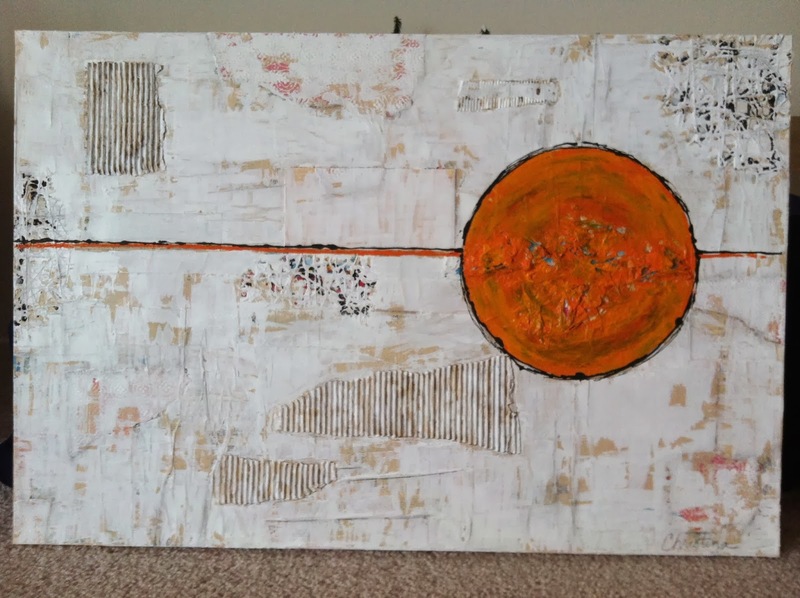 I used cardboard and crumpled tissue paper for texture. I painted it with buff and then white acrylic paint using a credit card as a brush in order to leave some of the background uncovered. Finally I added the orange and black to complete the painting. I used a charcoal pencil to shadow some of the textured areas but I’m not sure it’s even noticeable to anyone but me. I am happy with the way this piece turned out because it looks the way I imagined it. Believe me, that doesn't happen all that often. In addition, my daughter wants this painting. She has never before asked me to give her a piece of my art. She says she is going to hang it over her desk and I am extremely happy that she likes it. You know how weird coincidences happen in life sometimes? 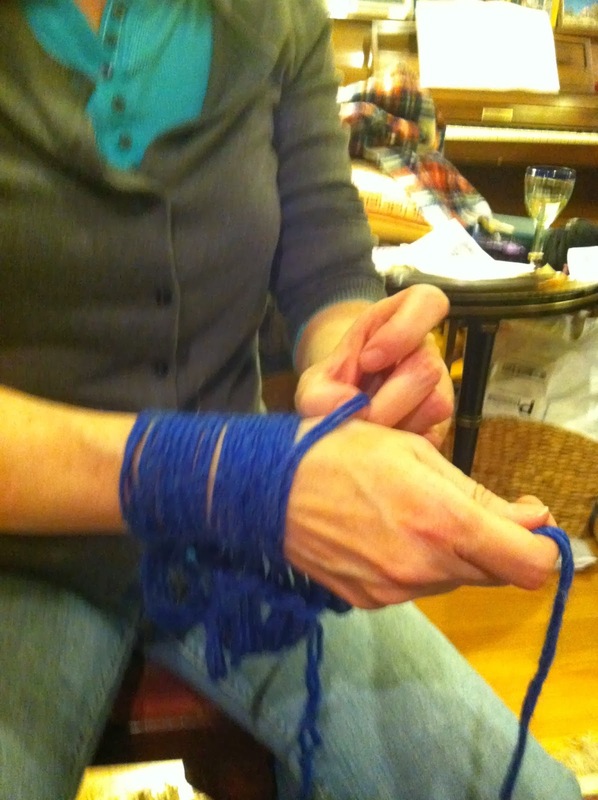 I was talking to a friend the other day and she asked me if I had ever done arm knitting. 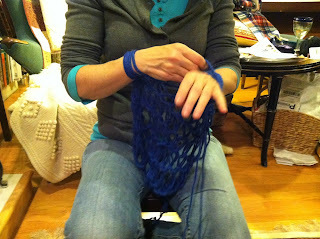 Well, I haven’t thought about arm knitting in a long time. It’s something I had heard of, but never tried (I am not one of those women who have a stash of yarn lying around the house). I told my friend that I had never tried it, but would like to learn how to do it someday. Three days later I am at a friend’s house for dinner and a young lady is wearing a scarf that she made herself by … (you guessed it ) … arm knitting! It was adorable. She said she could teach me how to do it and I could make a scarf in less than an hour. 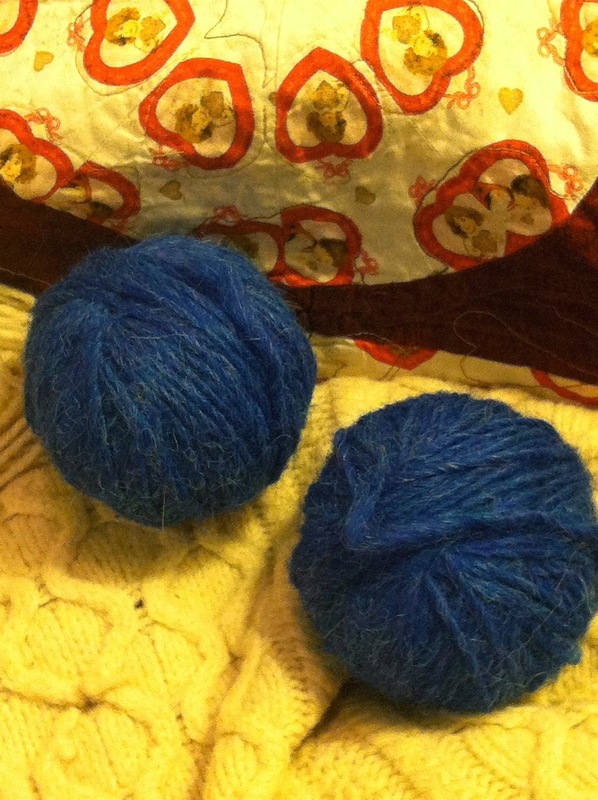 Luckily, my gracious hostess IS one of those women who have a stash of yarn and she gave me 2 skeins of beautiful blue llama/wool yarn. I was so excited! 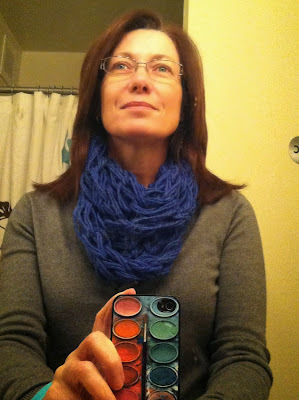 My young friend taught me how to arm knit and she completed a scarf for our hostess. I completed my scarf in about 45 minutes. I think I could have done it in a shorter amount of time, but I was drinking wine at the same time. The process was very simple and I would like to do it again. I’d have to find a YouTube video (such as this one) to guide me in the casting on and off, but the rest I could do from memory. I recommend you try it because it's an instant gratification project. The bad news is that you will have to go into a yarn store to buy yarn and we both know how dangerous that will be! Good luck. I keep hearing about people choosing a special word for 2014. It's a variation on the New Year's resolution, which is something I don't like to make. Selecting a word for the year means that your actions and decisions are guided by that word. After some thought, I have selected my word for the year. I plan to consciously strive to stretch myself this year in all the things that I do whether it is art, work, or relationships. I will try to do a little bit more than I think I am capable of. I will stretch myself beyond my limits. Back in August, I set a goal to paint 100 pieces of paper by the end of 2013. The good news is that I successfully met my goal! I did have to work all the way up through New Years Eve to make it happen though (I work best under pressure). Here is a portion of my collection. As you may be able to tell from the photos, I started with large pieces of paper and got smaller toward the end. Yes, I actually counted a tag as 1 piece of paper! If it had paint on it, then I counted it. I used my Gelli plate for almost all of the papers. I think I am getting better at creating with the plate, but I still have to practice more. I used mostly craft paint and I think my results would have been better if I had used higher quality paint. I wanted to use up what I had rather than buy new paint. I’m sure you are wondering what I am going to do with my 100 papers. When I set my original goal, I decided not to worry about what the final products were going to be. Creating the painted papers was enough for now and I am happy with the results. Perhaps my goal for 2014 should be to create art using 100 pieces of painted paper! I'm going to think about that for awhile longer before I decide.